This week, we have released a new function – creative and intelligent Eco Driving. The indispensable solution for fleet management and vehicles smart control in general. Now, tracking your vehicles, you can evaluate the driver behavior according to different factors like speeding, harsh driving and idling. The new application will make your business more productive and reduce the costs. Specifically, it allows you to reduce the costs for penalties, fuel, auto repairs and increase employees safety by reducing car accidents. Well, get down to the details. There are three main types of violations: Speeding, Harsh driving and Idling. 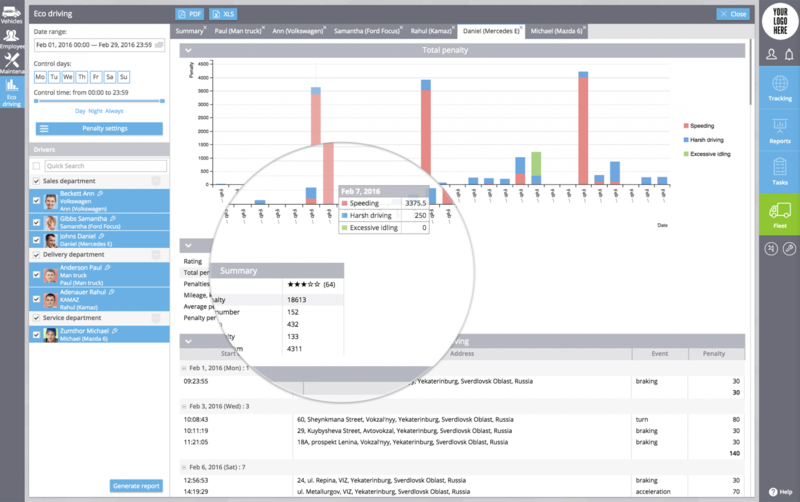 Navixy obtains the data of a committed violation from a vehicle GPS tracker and makes it visual to analyze. Each type of violation has its own set of penalty points which are taken into account by the system for its further rating compilation. 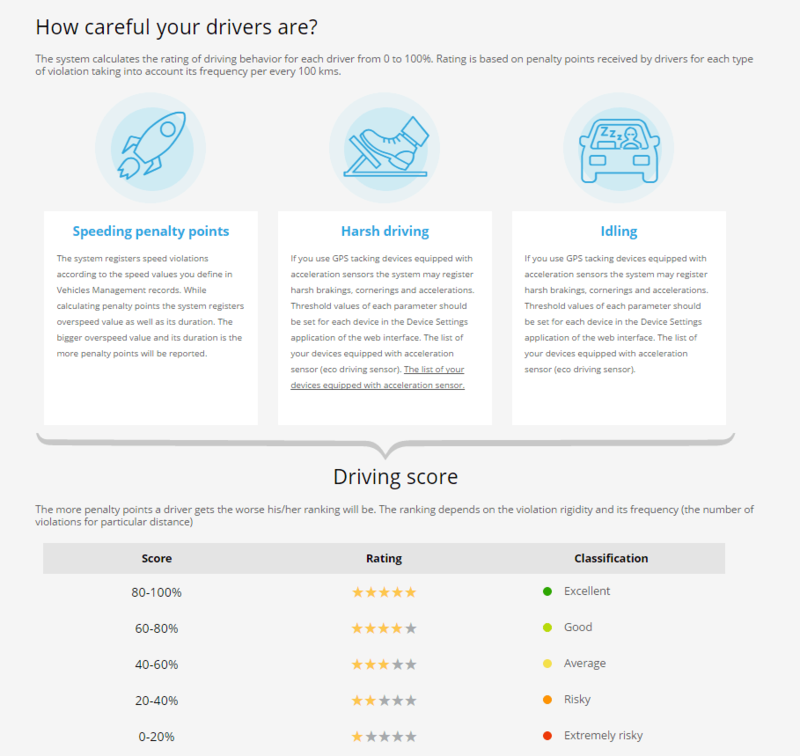 Driving scores or driving accuracy rating shows you how careful the employee was. As we can see in the picture above, more scores a driver has – more careful and responsible on the road he was. Now, a bit more particularly on settings and penalty points. 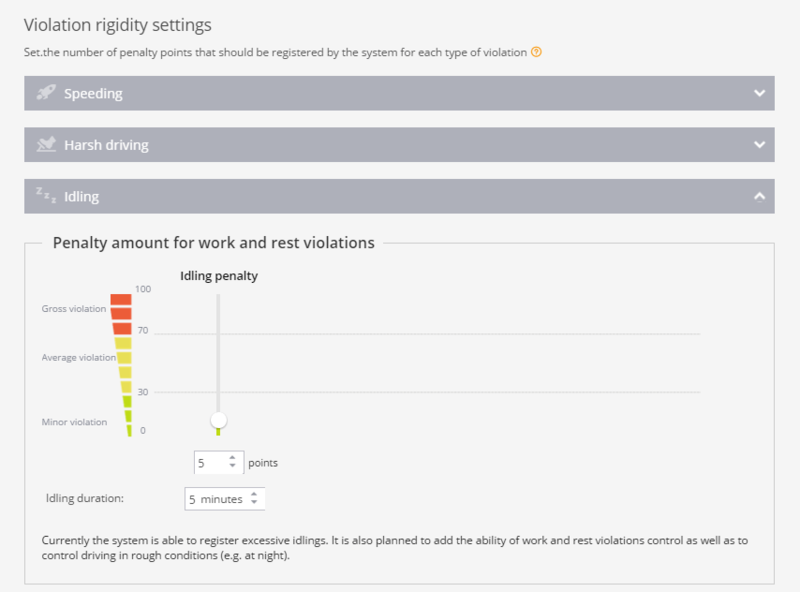 Violation rigidity settings help you to set up the necessary conditions for the violations calculation. First, enter the starting value for the overspeed determination. You can choose “From vehicle parameters” to set up the start value as a permitted speed from the asset summary or you can specify it immediately. Then, set the number of penalty points (how strict you want the violation would be) for speed limit overrun by 10-20 km/h, 20-30 km/h, 30-50 km/h or more than 50 km/h. You can also specify the speed duration to know when the speeding begins. Since harsh driving monitoring feature is based on the hardware’s accelerometer sensor, it is available only for latest devices that provide such a functionality. Most of them also allow to set up appropriate thresholds to determine what driving behaviour is considered to be harsh. 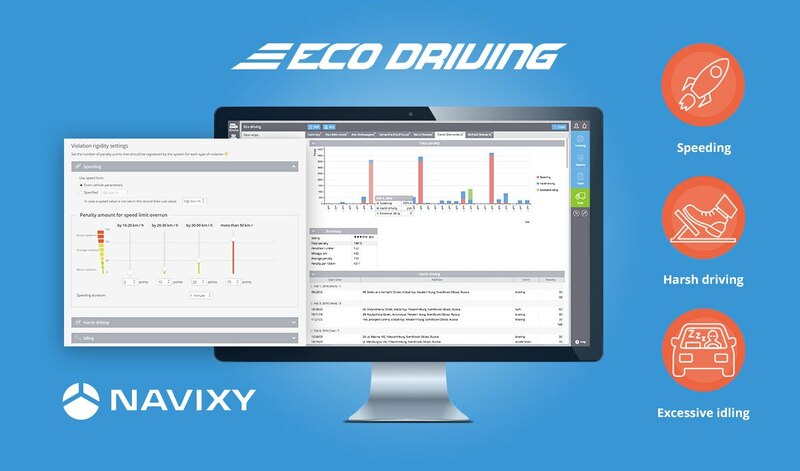 Thus, Navixy can monitor the harsh acceleration, braking, turn, acceleration in turn and braking in turn. Beneath penalty points value you can see the list of your devices that do not support harsh driving events. Handy! Navixy is able to register vehicles’ excessive idling. 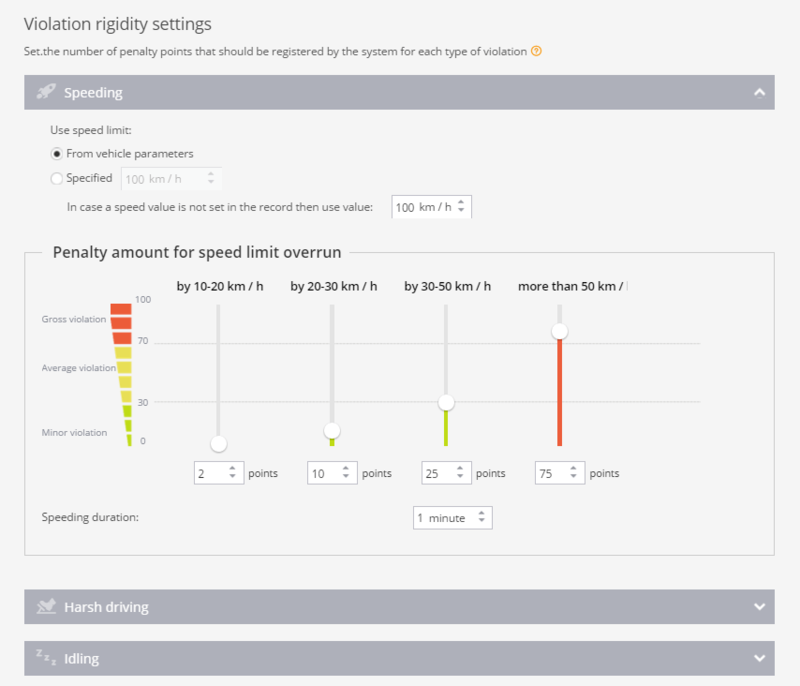 Choose the idling duration value as a starting mark and specify how many penalty points you want to assign. It is also planned to add the ability of work and rest violations control as well as to control driving in rough conditions (e.g. at night). Our team has been working on the addition. We will definitely inform you as soon as it appears. After you have set all the settings, you can generate a report of an employee or a group of objects for detailed information. Graphics visually display the total penalty and mark objects’ speeding, idling and harsh driving with special colours. 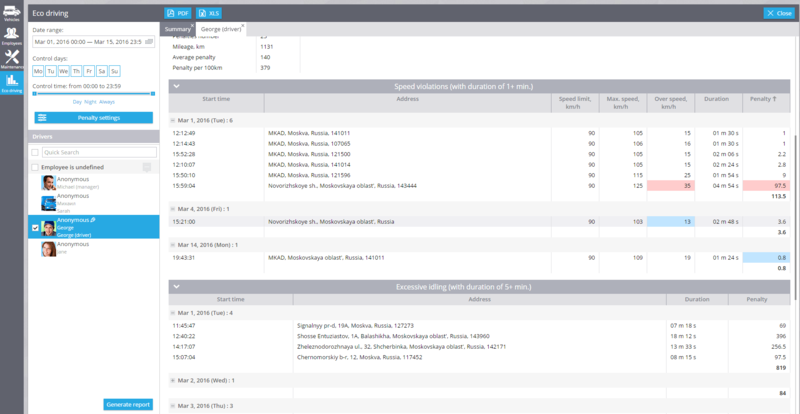 Just choose an employee or a group of workers, select the date range and click on “Generate report”. Simple. A detailed information table goes right after the Total penalty graphic and the driving accuracy rating. Learn each violation (Speeding, Idling, Harsh driving) of a certain employee. 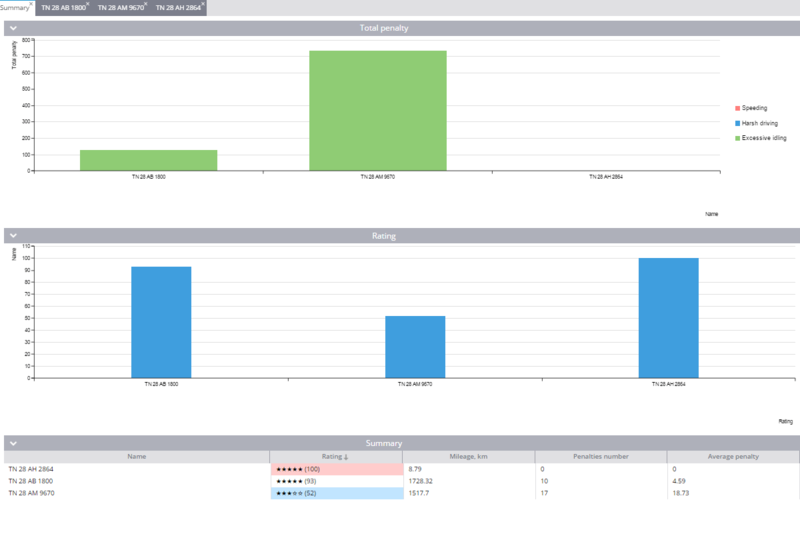 Tab “Summary” brings together information about all selected objects: total penalty, rating. And Finally you can export the report in PDF or XLS. Try our new function to make sure that it really works for your business. If you have some questions or suggestions, please, contact us. Join our social communities to be always aware of the latest news and developments.